It’s about to begin: THE HOLIDAYS. Dun dun dun! Are you wondering how you’re going to survive? Well, you KNOW you will – somehow. 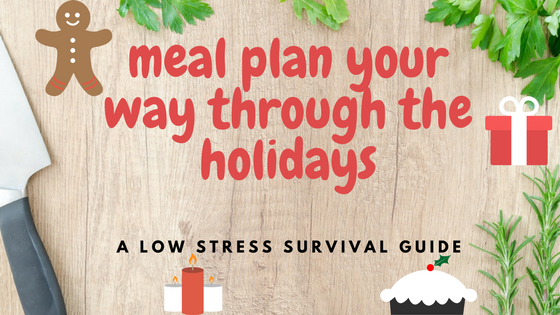 But if you’re worried about how healthily you’ll eat or how much MORE you’ll end up spending or if you’ll have any time to cook real food, you already know that you need to do some (at least very basic) meal planning. You already KNOW meal planning saves your health, your time and your money. You also know it doesn’t come naturally. 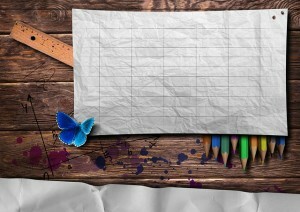 So I’d like to give you some real, solid, actionable tips to start using RIGHT NOW. As I’m sure you can guess, my freezer meal club saves me this time of year. I’ll be pulling out a mostly to fully prepared frozen meal almost half the nights of the week thanks to the lovely ladies in my club. This relieves so much stress ANY time of year, but especially this time of year. If you’re not in a club (which you totally should be), you can prepare a few extra meals to freeze before the holiday rush starts. The easiest way is to simply double up a few recipes the night you make one for dinner. Take the extra to freeze and have it again when life gets hectic. Just grab a piece of paper. Keep It Simple, Sister! started. Use SOMETHING and job down what you’ll have each night or (if you’re really sweating bullets right now) every other night. This time of year can be filled with spontaneous changes of plan, both fun and not-so-fun, so understand that flexibility will be needed. Think arrows, circles and cross-outs. This is one of the reasons I love Plan To Eat. I can easily click and drag a meal from one day or week to the next and my shopping list adjusts accordingly. Even without that shopping list feature, I do love being able to move the meals around on the calendar, as this allows me to SEE what’s coming up, make sure we are not having three bean dishes in a row and lets me space out my freezer meals reasonably, as well. The third tip is to stock the pantry OR shop the pantry. If you shop your pantry, you spend less time and money shopping elsewhere. If you stock your pantry, stock it with your favorite staples that make quick and easy meals your family enjoys (or at least tolerates): pasta and sauce, canned fish, nut butter, canned beans, salsa, rice, canned vegetables, etc. Then, if you find yourself stuck with nothing to eat, you can pull something together that might not be gourmet, but simply nourishing. Fourth, use your favorite homemade “cheater meals” or your home’s “fast food.” That could be anything but often uses those above mentioned pantry staples. Need ideas? Check out this post: Fast Food, Real Food – the Holidays and Beyond. Fifth, keep meals EXTRA simple this month. There’s a high liklihood that you’ll be going out more, attending parties and other events, where there will be plenty of treats and splurges. So it’s OK to keep it extra simple at home. Beans, simple soups and sandwiches, pasta, salads – they are all easy, fast, and nourishing. Check out everything from the Crockpot Lady, but for extreme ease, take a close look at her Dump and Go recipe collection. Now, if you’re REALLY ambitious, I’ll add some extra credit tasks. DO NOT DO THESE unless they bring you joy! Could you work in some time for advance holiday preparation? Maybe pre-make and freeze cranberry sauce? Or prep your brine in advance? Or perhaps freeze a batch of rolls after their first rise? 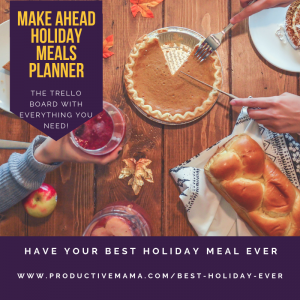 If you did two holiday meal tasks, you’ll be THAT MUCH ahead on serving day! This idea is the inspiration for my Make Ahead Holiday Meal Planner. Finally, have a little fun. Enjoy those holiday flavors, if you enjoy them. Eggnog muffins? Cranberry pork? Pumpkin anything? Peppermint hot cocoa? The flavors help make this time of year special. So take advantage of them to make the “ordinary” days stand out just a little more. This post may contains affiliate links, which means that if you click on one of the product links, I might benefit in some way. Please feel free to check out the full affiliate statement and disclosure here.